Monique Goldwater is the directer of Monique Ballet in San Francisco. She has been a special guest dancer and choreographer for Madame Butterfly performed for the Golden Gate Opéra and the California Opéra since 2004. She has been working with the Ledoh Salt Farm and performed at Asian Museum and many local art galleries. 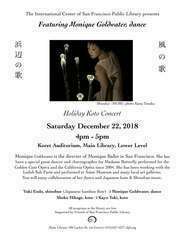 You will enjoy collaboration of her dance and Japanese koto & Shinobue music.